I need a jewelry box of sorts. My (eensy but growing) collection is now housed (and overcrowded) in a box Yuri (our Japanese exchange student from 18+ years ago) sent as a wedding gift (yes, all the way from Japan). It's served me well, but we're ready for both an upgrade in space and style. I'm thinking green (of course) and vintage. Green. Vintage. Train Case. Excellent. All gathered (with much deliberation, mind you) from Etsy. 3. vintagegoodies: I like how deep this is and it comes with a key. 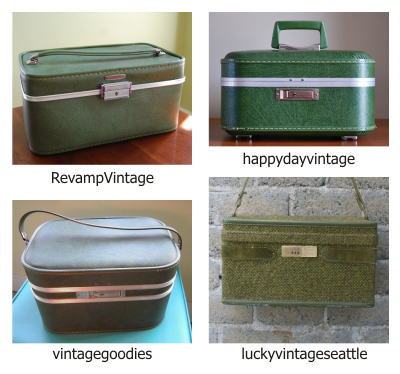 4. luckyvintageseattle: Tweed! and you can't see it, but the lining is gorgeous. And seriously: tweed. Tweed. And now I'm back to the original dilemma: how. to. choose. Either way, I'm excited about the look, the color, the textures. And I think there will undoubtedly be a little of that vintage smell that will always make me think of my grandmother in curlers. Ahhh. Can't wait. But seriously now: how. to. choose?